Cadres of Charles Anthony Brigade and Senior Commanders of the Liberation Tigers celebrated the fifteenth anniversary of the formation of the brigade by holding a sports and cultural event which started at 3.30 p.m. Monday in an undisclosed sports ground in Vanni, sources said. Charles Anthony brigade, the first conventional fighting formation created by the Liberation Tigers on 10 April 1991 was initially trained under the leadership of Col.Balraj. Col. Yarlini (Vithusha), Special Commander of the Malathi Women Regiment of the LTTE, hoisting the flag at the sports event. Special Commander Lt. Col. Nakulan of Charles Antony Brigade hoisting the Brigade's flag. Special Commander of Malathi Brigade, Col.Vithusha hoisted the Tamileelam flag. Special Commander of the Charles Anthony Brigade, Col.Nagulan, hoisted the Brigade's flag. Following the lighting of memorial lamps to the pictures of Brigades martyrs and that of Lt.Charles Anthony, cadres took part in several sports events including volley ball and Kapadi, a popular local sport. Sports events were supervised by Northern Region Special Commander Col.Theepan, Senior Commander of Northern Command Lt.Col.Arivu, and Lt.Col.Nagulan. Cultural events included drama, poetry recital and dances, according to sources attending the event. The special brigade had met more than seventy-five battles with the motto ‘Do or Die,’ said one of the commanders of the Charles Anthony brigade, Lt.Col. Amuthab, addressing the event. 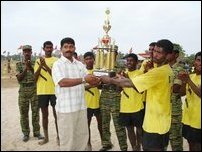 Col.Theepan, Lt Col Veeramani, LTTE's Head of Sports Section, K Pappa and Special Commander of Sothiya Brigade, Col Thurga gave away the prizes for winners and participants. Charles Anthony Brigade contributed to the success in many conventional battles fought against the Sri Lanka Army (SLA) in Oyatha Aligal-1, the battle at Mullaituvu camp, Battle to recapture Kilinochchi, Oyatha Alaigal-2, Jaya sukurui and the Battle of Elephantpass. 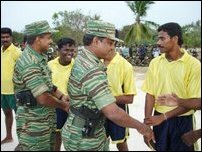 Special Commander Col. Theepan, LTTE's Northern Front Forces greeting the winners with Lt. Col. Nakulan. Commanders Lt. Col. Arivu and Kopinth greeting the winners. Military analysts say that with the fall of Elephant pass Charles Anthony Brigade established Tigers as the only non-state military force in the world today capable of complex manoeuvre war fighting. The Elephant pass was described as "impregnable" by a US army officer who visited the garrison months before its fall in April 2000. Charles Anthony, from Trincomalee district, was a close associate of Pirapaharan, and was killed in a close encounter with Sri Lanka Army soldiers in Meesalai area on 15 July 1983. Pirapaharan named the Charles Anthony Brigade as a tribute to his close friend. LTTE fighters of Charles Antony Brigade playing Kapadi - a traditional game. Mr. Papa, Head of the Tamileelam Sports Wing with the winners of the tournament.